Paul Lovens drums, percussion, etc. 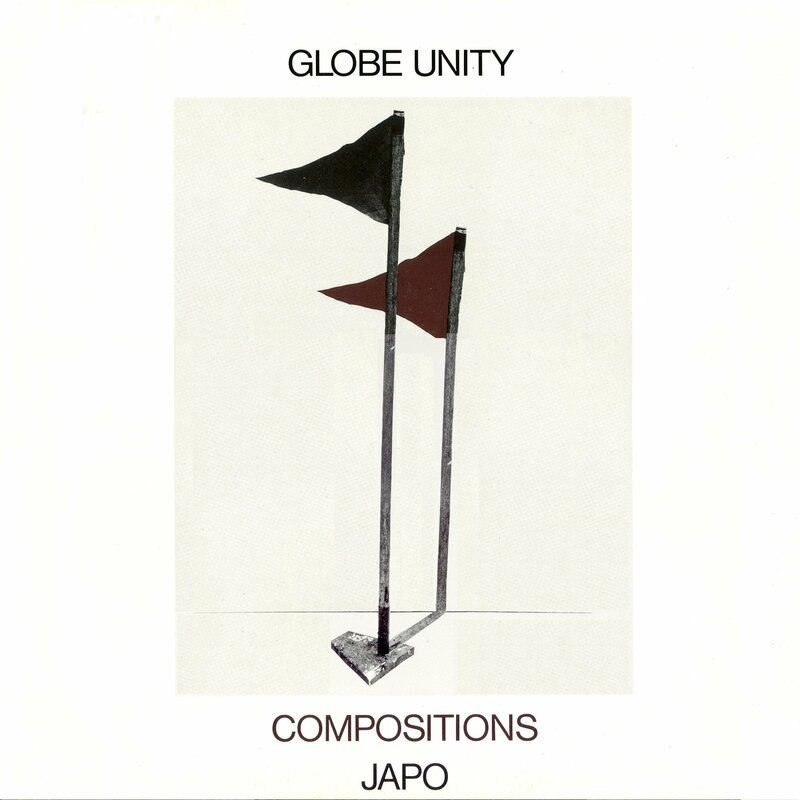 Globe Unity’s Compositions makes a natural partner to Improvisations, also released on JAPO. This is the last of the collective’s three albums for ECM’s sister label, and ends a sporadic tenure with colorful tapestries of internally composed pieces. 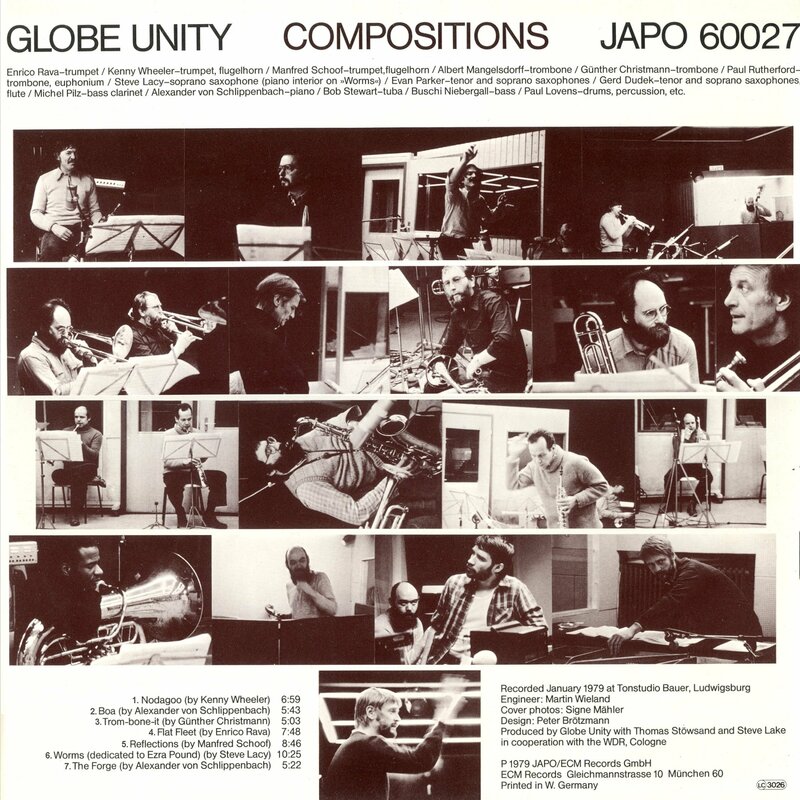 What makes this album such an archival treasure its early glimpse into the compositional careers of trumpeters Kenny Wheeler, Enrico Rava, and Manfred Schoof. “Nodagoo” is quintessentially Wheelerian, opening with a solemn tuba before erupting into a late-night free jazz masterstroke spearheaded by Evan Parker on tenor. All the classic elements are there: an almost literary feel for structure, with room to grow, and a penchant for contrasts. Rava’s “Flat Feet” blends just the sort of playfulness and heavy traction one might expect from his younger self. One can’t help but read a symphony of smiles into its jaunty contours. It is, as might be expected, a delightful tangle of trumpets, but legendary trombonist Albert Mangelsdorff gives us plenty of meat to chew on as well. Rava is a burst of flame and a joy to experience on such historical terms. The trumpet squeals of Schoof’s “Reflections” begin the album’s most cinematic track, which follows an unusual narrative arc through Parker’s circular sopranism and Alexander von Schlippenbach’s sensitive monologue on piano, while the brass and winds suspend their motives high above sea level. Von Schlippenbach himself offers two pieces. “Boa” has a more nostalgic, big band sound, kept confidently in check by drummer Paul Lovens at every turn. Superb solos on soprano saxophone (courtesy of the inimitable Steve Lacy) and bass clarinet (Michel Pilz) make this slice of anatomical fortitude glow like a lightning bug. “The Forge,” which ends the album, is a propulsive blast of gold that boasts some of the most concentrated playing on the record. Trombonist Günther Christmann’s offering is “Trom-bone-it,” a jovial piece that grows from outtake to full-force jungle. Such elevations are Globe Unity’s forte and reveal an astonishing ability to keep every expression clear in the face of chaos. Like the Art Ensemble of Chicago at its loudest, this one takes fun seriously. Lacy counters with “Worms,” which bears suitable dedication to Ezra Pound, whose gnarled poetics can be heard in musical parallels throughout the 10-minute piece. Its massive chains of dissonance give relatively little room for solo space, opting instead for a grander, organic ecosystem. While not as exciting as its freely improvised predecessors, Compositions nonetheless affords more than enough space for the unexpected and is a worthy stopover on your JAPO collecting adventures.